So Storyhouse has just announced the big name shows coming to a certain much talked about building in our fair city this autumn. And we must hold our hands up here – yes, we admit it, we’re beyond excited to know that Storyhouse will be opening its doors next month – on 11 May, to be precise. We’re also thrilled to hear that a whole host of large scale touring productions will now be stopping off in our city each year. As much as we love our excursions to fab cities like Liverpool and Manchester, it’s good to have the option to stay home and see national touring productions coming to us in Chester instead. So as the count down continues to the opening of the £37m Storyhouse centre on Hunter Street in the heart of Chester, we’ll give you a reminder of what entertainment is in store. And the good news is that there certainly seems to be entertainment aplenty on offer, catering for all tastes. 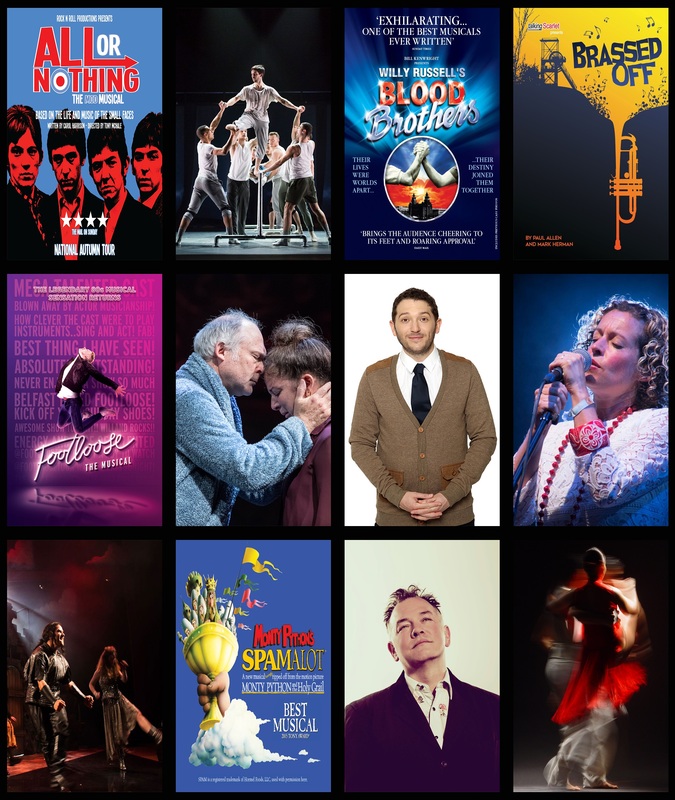 We’ve the promise of the usual high standard of homegrown productions from the Storyhouse rep company over the summer months and then a whole host of shows courtesy of national touring productions through the autumn. This is, of course, in addition to the multiple other events and activities that the Storyhouse team will be staging. And don’t forget that in addition to the three tier, 800 seat main theatre, the centre will also be home to a cafe, restaurant, rooftop bar, boutique cinema, the Garret studio theatre and Chester Library. On the touring production front, we’ll see real musicals like West End hit Footloose (5-9 September), the multi award-winning Blood Brothers (9-14 October) and All or Nothing (27-30 September), based on story of the influential 60s mod group Small Faces. There’ll also be a chance to sample some legendary Python humour courtesy of Spamalot! This musical was inspired by Monty Python and the Holy Grail and runs from 31 October to 4 November. Meanwhile, for those who like a hefty dose of laughter – stand up style – there’ll be a visit from comedian and writer Stewart Lee, who’ll be bringing his Content Provider tour to Chester on 3 October, as well as a visit from 8 Out of 10 Cats Does Countdown regular Jon Richardson on 19 September. If dance is more up your street, then be prepared to be captivated by the multi talented all male dance company BalletBoyz, who bring their new show to Storyhouse on 30 October. And hit show Tangomotion brings the sights and sounds of Argentina to the city on 18 October, with world class dancers accompanied by the acclaimed Tango Siempre quartet. And if you fancy a spot of opera, then you’ll be glad to hear that the acclaimed Opera Della Luna will be bringing their latest show, Tales of Offenbach to the theatre from 22-23 September. Meanwhile, if critically acclaimed drama piques your interest, then check out Things I Know to Be True from leading physical theatre company Frantic Assembly (7-11 November). And also no doubt striking a chord for drama lovers will be the production of Brassed Off from 24 to 28 October. The play looks at the story of the miners’ strike through the eyes of a colliery brass band. The production will feature a local brass band alongside the company of professional actors. And finally, folk music fans will be able to listen to the dulcet tones of Kate Rusby, who is stopping off at Storyhouse on 20 October as part of a short tour to celebrate 25 years of performing. Storyhouse’s artistic director, Alex Clifton says: “We are delighted with the range of our opening touring season. This is a programme that tells stories in so many guises: through dance, music, comedy and drama. And for those who can’t wait until Autumn to set foot inside Storyhouse, you’ll be pleased to know that it opens its doors on 11 May with a host of home produced shows. These include a new version of The Beggar’s Opera, Alice in Wonderland, and Shakespeare’s A Midsummer Night’s Dream and Julius Caesar. All four productions will be performed in rep by a company of 26 actors – the largest rep company in the UK outside of the RSC and National Theatre. And this summer will see the return of the mega popular Moonlight Flicks, with a range of movies, from La La Land to Grease, shown in the stunning setting of the Roman Gardens between 4 July and 26 August. Tickets for the touring season are on sale now – visit storyhouse.com or call 0844 815 7202 to find out more.